So, the first week of NaNo has officially come and gone. Despite everything, I’ve managed to get way ahead of par and have already hit the halfway mark with 25,173 words. I think the official par for today is 15,000, so that puts me about 10,000 words ahead. I’ve been trying to do an average of about 2,000 words a day, instead of just the minimum 1,667. Yesterday, I made a personal best at just over 6,000 words. I’m trying to create that buffer, because I know that I’m going to need it the week of Thanksgiving. The day before Thanksgiving, I’m helping with the opening day of what’s probably Knoxville’s biggest Christmas event, the Fantasy of Trees, that night, then going to dinner, then going to work until about 2 in the morning. Then coming home, possibly going back to work for about an hour on Thanksgiving morning, coming home, helping my mom make the dishes for dinner, then going to my Aunt’s for dinner. Anyway, started out with one story, switched to the other. 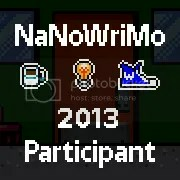 Now I’m back with my original NaNo idea for this year, and that’s what the majority of my writing has been about. About 20,000 words worth of the 25,000 are that story. Yeah, I’ve switched stories three times. I’ve also discovered that, for instant inspiration, and thus word count, just add a puppy. Everything’s better with baby animals. Cheers, and good luck to everyone doing NaNo!